In order to avoid mistakes when reserving a room with an open-air bath, we will walk you through the reservation procedure and the points to check before clicking on the button to confirm reservation. (1) Rooms with displays “带露天风吕客房” under the rooms pictures, it means the rooms have open-air baths. 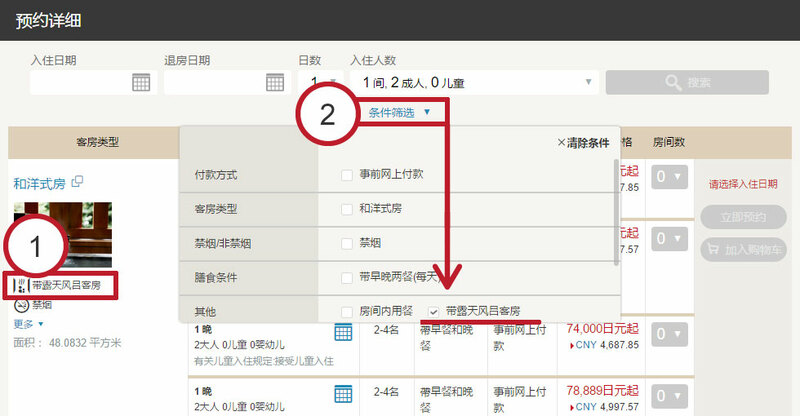 (2) Click “条件筛选” above lists of rooms and check “带露天风吕客房“, then lists of rooms will be changed lists of only rooms with open-air baths.